Remote keyless entry, extended rangeUnlock and lock the car using buttons on the keyfob. Replaces regular RKE. No additional value because not possible to compare across models. Unlock and lock the car using buttons on the keyfob. Replaces regular RKE. No additional value because not possible to compare across models. 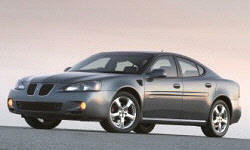 None of our members have yet commented on the available features of the 2008 Pontiac .